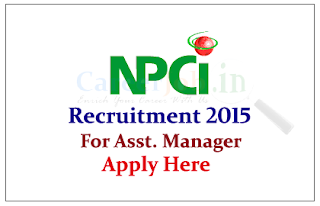 National Payment Corporation of India is recruiting for the post of Assistant Manager for the year of 2015. Eligible candidate can apply here on or before 25th May 2015. National Payments Corporation of India (NPCI) was incorporated in December 2008 and the Certificate of Commencement of Business was issued in April 2009. The company, which has been incorporated as a Section 25 company under The Companies Act 1956, is now under Section 8 of The Companies Act, 2013. Eligible Candidates can apply online on or before 25.05.2015,for more details check official notification.